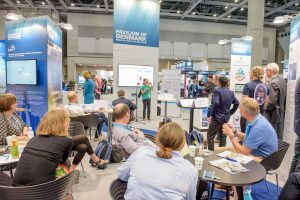 On September 21 the IWA World Water Congress & Exhibition closed its doors in Tokyo, a highly vibrant and very inspiring week where nearly 10,000 water professionals from 98 countries met, exchanged innovations and created a huge networking environment that helped to shape our water future. An important element on the IWA exhibition floor this year was the Isle-IWA Emerging Technologies Pavilion & Program. The pavilion facilitated 11 carefully selected innovative companies from around the world. Unique at the Emerging Technologies Pavilion was the intense involvement of 4 global supporters, each supporting this program from a different angle. For PureTerra Ventures it was a great place to meet new innovations to potentially invest in. The ETP was a meeting point for Aqualia, Anglian Water and SUEZ, and of course they were also heavily involved in the conference program. 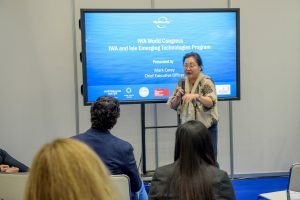 VIDEO: Highlights and themes of the day: Water professionals discussed resilience and innovation with a focus on the Japanese experience. The day ended with the gala ceremony for the Project Innovation Awards – check the winners! VIDEO: Engaging in a new sanitation evolution the #WorldWaterCongress brings new ideas and spreads innovation. Non-sewered sanitation might well be the future, because water is not infinite. Have you thought of a toilet that doesn’t use water? IWA initiated a Specialist Group with this focus. VIDEO: Dispersion of innovation is facilitated by IWA as a hub of hubs. Defining problems and solutions requires the involvement of innovators from across sectors, geographies and income levels. Innovation is needed but the first step is to define the problems to be solved. All water stakeholders are needed to develop programming and platforms around innovation.